W. Mitt Romney is the former Governor of Massachusetts. His influential father was three times elected Governor of Michigan, and appointed Secretary of Housing and Urban Development in the Richard M. Nixon administration. Romney had a privileged upbringing, attending the Cranbrook Schools in Bloomfield Hills. The Romneys are Mormon, and he went on to Brigham Young University before matriculating at Harvard Business School and then Harvard Law School. In 1984, Romney founded Bain Capital, an investment company that quickly came to own hundreds of other companies, including Staples, Domino's Pizza, Bright Horizons Childcare, Sealy, FTD Florists, Brookstone, and The Sports Authority. Romney's claim to national fame came in 1999, when an inquiry into corruption found that the two top officials who led Salt Lake City's bid for the 2002 Winter Olympics had actually paid bribes of more than $1 million to 24 members of the International Olympic Committee. Organizers were embarrassed by the scandal, but terrified by hints that corporate sponsors might reduce their financial commitments. Romney was the Salt Lake City Olympics' savior. As the event's CEO, he brought in new, stricter policies on ethical behavior (like having some) and, after the unfortunate events of September 11, Romney instituted what some people considered to be draconian security measures for the event. Even so, millions of tickets were sold, millions more watched on TV, and the athletic competition and clearly rigged judging were memorable. As a businessman, Romney knows how and when to capitalize his assets, and in the Olympics afterglow he quickly announced his candidacy for Governor of Massachusetts. With no prior experience holding political office, Romney won handily. He was Massachusetts' fourth Republican Governor in a row, somewhat surprising for a state where only 13% of voters are registered as Republicans. 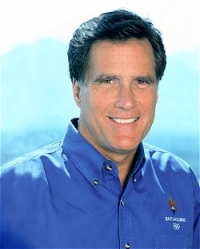 Romney was prominent among the contenders for the 2008 Republican Presidential nomination, despite the fact polls indicate 17% of Americans would refuse to vote for any Mormon candidate. Still, to appeal to conservatives, he has taken a hard stance on gay marriage, by a quirk legalized in his state by a judicial action of the state supreme court. In response he activated a long-inactive law aimed at interracial marriage, which forbids nonresidents to marry in Massachusetts if it is illegal for them to marry in their home states. He called for gun control legislation when he ran for the Senate in 1994, but in 2006 he joined the National Rifle Association. He has also taken a firm stand against illegal immigration, which is somewhat ironic, as the evidence suggests that Romney's own grandfather came to America as an illegal immigrant. His great-grandfather, a devout Mormon in a time when his church encouraged polygamy, fled the US with his multiple wives in 1884, when American law could strip polygamists of the right to vote or serve on juries. Romney's grandfather and father were born and raised in Mexico, and Romney's father was a child when his family left Mexico at the height of the Mexican Revolution, in 1912. Romney's father's and grandmother were American citizens under the law at that time, and came to America on a train, while his grandfather crossed the border northward in classic "illegal immigrant" fashion, entering US territory on a long walk over barren desert land. Romney won the Republican nomination for the 2012 Presidential election. His chosen running mate, Wisconsin Congressman Paul Ryan, is intelligent, photogenic and likable, and while young he is considerably more experienced than the party's nominee in 2008. But Ryan is also the architect of a budget plan which dismantles Medicare while at the same time giving tax cuts to the wealthy -- a plan which passed the US House and which Romney himself endorsed -- and this may bring several states which were considered safe Republican territory back into the fray, including populous Florida.